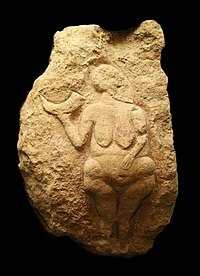 The Upper Paleolithic (or Upper Palaeolithic, Late Stone Age) is the third and last subdivision of the Paleolithic or Old Stone Age. Very broadly, it dates to between 50,000 and 10,000 years ago (the beginning of the Holocene), according to some theories coinciding with the appearance of behavioral modernity and before the advent of agriculture. 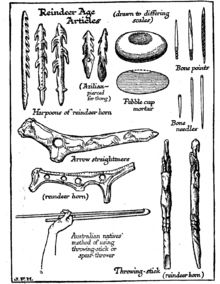 The peopling of Australia most likely took place before c. 60 ka. Europe was peopled after c. 45 ka. Anatomically modern humans are known to have expanded northward into Siberia as far as the 58th parallel by about 45 ka (Ust’-Ishim man). The Upper Paleolithic is divided by the Last Glacial Maximum (LGM), during about 25 to 15 ka. The peopling of the Americas occurred during this time, with East and Central Asia populations reaching the Bering land bridge after about 35 ka, and expanding into the Americas by about 15 ka. In Western Eurasia, the Paleolithic eases into the so-called Epipaleolithic or Mesolithic from the end of the LGM, beginning 15 ka. The Holocene glacial retreat begins 11.7 ka (10th millennium BC), falling well into the Old World Epipaleolithic, and marking the beginning of the earliest forms of farming in the Fertile Crescent. As the glaciers receded sea levels rose; the English Channel, Irish Sea and North Sea were land at this time, and the Black Sea a fresh-water lake. In particular the Atlantic coastline was initially far out to sea in modern terms in most areas, though the Mediterranean coastline has retreated far less, except in the north of the Adriatic and the Aegean. The rise in sea levels continued until at least 7.5 kya (5500 BC), so evidence of human activity along Europe’s coasts in the Upper Paleolithic is mostly lost, though some traces have been recovered by fishing boats and marine archaeology, especially from Doggerland, the lost area beneath the North Sea. 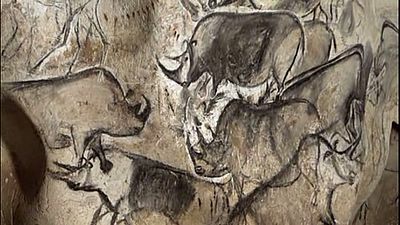 Wall painting with horses, rhinoceroses and aurochs is made at Chauvet Cave, Vallon-Pont-d’Arc, Ardéche gorge, France. Discovered in December 1994. Kostenki XVII, a layer of the Kostenki (Kostyonki) site, on the middle Don River, was occupied by the early upper paleolithic . Ibex-headed spear-thrower, from Le Mas-d’Azil, Ariège, France, is made. It is now at Musée de la Préhistoire, Le Mas d’Azil. Gilman, Antonio (1996). “Explaining the Upper Palaeolithic Revolution”. Pp. 220–239 (Chap. 8) in Contemporary Archaeology in Theory: A Reader. Cambridge, MA: Blackwell. ^ Rightmire, GP (2009). “Out of Africa: modern human origins special feature: middle and later Pleistocene hominids in Africa and Southwest Asia”. Proc Natl Acad Sci USA. 106 (38): 16046–50. Bibcode:2009PNAS..10616046R. doi:10.1073/pnas.0903930106. PMC 2752549. PMID 19581595. ^ “Klein: Behavioral and Biological Origins of Modern Humans 3 of 3”. www.accessexcellence.org. ^ “Klein: Behavioral and Biological Origins of Modern Humans 1 of 3”. www.accessexcellence.org. ^ a b Higham, Tom; Douka, Katerina; Wood, Rachel; Ramsey, Christopher Bronk; Brock, Fiona; Basell, Laura; Camps, Marta; Arrizabalaga, Alvaro; Baena, Javier; Barroso-Ruíz, Cecillio; Bergman, Christopher; Boitard, Coralie; Boscato, Paolo; Caparrós, Miguel; Conard, Nicholas J.; Draily, Christelle; Froment, Alain; Galván, Bertila; Gambassini, Paolo; Garcia-Moreno, Alejandro; Grimaldi, Stefano; Haesaerts, Paul; Holt, Brigitte; Iriarte-Chiapusso, Maria-Jose; Jelinek, Arthur; Jordá Pardo, Jesús F.; Maíllo-Fernández, José-Manuel; Marom, Anat; Maroto, Julià; Menéndez, Mario; Metz, Laure; Morin, Eugène; Moroni, Adriana; Negrino, Fabio; Panagopoulou, Eleni; Peresani, Marco; Pirson, Stéphane; de la Rasilla, Marco; Riel-Salvatore, Julien; Ronchitelli, Annamaria; Santamaria, David; Semal, Patrick; Slimak, Ludovic; Soler, Joaquim; Soler, Narcís; Villaluenga, Aritza; Pinhasi, Ron; Jacobi, Roger (21 August 2014). “The timing and spatiotemporal patterning of Neanderthal disappearance”. Nature. 512 (7514): 306–309. Bibcode:2014Natur.512..306H. doi:10.1038/nature13621. PMID 25143113. ^ “In North America and Eurasia the species has long been an important resource—in many areas the most important resource—for peoples’ inhabiting the northern boreal forest and tundra regions. Known human dependence on caribou/wild reindeer has a long history, beginning in the Middle Pleistocene (Banfield 1961:170; Kurtén 1968:170) and continuing to the present….The caribou/wild reindeer is thus an animal that has been a major resource for humans throughout a tremendous geographic area and across a time span of tens of thousands of years.” Ernest S. Burch, Jr. “The Caribou/Wild Reindeer as a Human Resource”, American Antiquity, Vol. 37, No. 3 (July 1972), pp. 339–368. ^ Attenbrow, Val (2010). Sydney’s Aboriginal Past: Investigating the Archaeological and Historical Records. Sydney: UNSW Press. pp. 152–153. ISBN 978-1-74223-116-7. Retrieved 11 Nov 2013. ^ Stockton, Eugene D.; Nanson, Gerald C. (April 2004). “Cranebrook Terrace Revisited”. Archaeology in Oceania. 39 (1): 59–60. doi:10.1002/j.1834-4453.2004.tb00560.x. JSTOR 40387277. ^ Wilford, John Noble (2 November 2011). “Fossil Teeth Put Humans in Europe Earlier Than Thought”. The New York Times. ^ Sandra Bowdler. “The Pleistocene Pacific”. Published in ‘Human settlement’, in D. Denoon (ed) The Cambridge History of the Pacific Islanders. pp. 41–50. Cambridge University Press, Cambridge. University of Western Australia. Archived from the original on 16 February 2008. Retrieved 26 February 2008. ^ “Humans killed off Australia’s giant beasts”. BBC News. 24 March 2012. ^ “The Trial Excavation at the Archaeological Site of Wong Tei Tung, Sham Chung, Hong Kong SAR”. Hong Kong Archaeological Society. January 2006. Archived from the original on 3 March 2009. Retrieved 21 August 2010. ^ Aboriginal Australia Art & Culture Centre. “Arrernte Aboriginal Art and Culture Centre Alice Springs”. Aboriginalart.com.au. Archived from the original on 24 May 2011. Retrieved 30 May 2011. ^ “The Peking Man World Heritage Site at Zhoukoudian”. 2014-11-14. ^ “Divers find traces of ancient Americans”. 9 September 2004. ^ M. Mirazón Lahr et al., “Inter-group violence among early Holocene hunter-gatherers of West Turkana, Kenya”, Nature 529, 394–398 (21 January 2016), doi:10.1038/nature16477. “Here we report on a case of inter-group violence towards a group of hunter-gatherers from Nataruk, west of Lake Turkana […] Ten of the twelve articulated skeletons found at Nataruk show evidence of having died violently at the edge of a lagoon, into which some of the bodies fell. The remains […] offer a rare glimpse into the life and death of past foraging people, and evidence that warfare was part of the repertoire of inter-group relations among prehistoric hunter-gatherers.” “Evidence of a prehistoric massacre extends the history of warfare”. University of Cambridge. 20 Jan 2016. Retrieved 20 Mar 2017. . For early depiction of interpersonal violence in rock art see: Taçon, Paul; Chippindale, Christopher (October 1994). “Australia’s Ancient Warriors: Changing Depictions of Fighting in the Rock Art of Arnhem Land, N.T.”. Cambridge Archaeological Journal. 4 (2): 211–48. doi:10.1017/S0959774300001086. .
^ Carpenter, Jennifer (20 June 2011). “Early human fossils unearthed in Ukraine”. BBC. Retrieved 21 June 2011. ^ Dousset, Laurent (2005). “Daruk”. AusAnthrop Australian Aboriginal tribal database. Archived from the original on April 9, 2011. Retrieved 27 August 2012. ^ “Aboriginal people and place”. Sydney Barani. 2013. Retrieved 5 July 2014. ^ Thorley, Peter (2004). “Rock-art and the archaeological record of Indigenous settlement in Central Australia”. Australian Aboriginal Studies (1). Retrieved 18 June 2011.